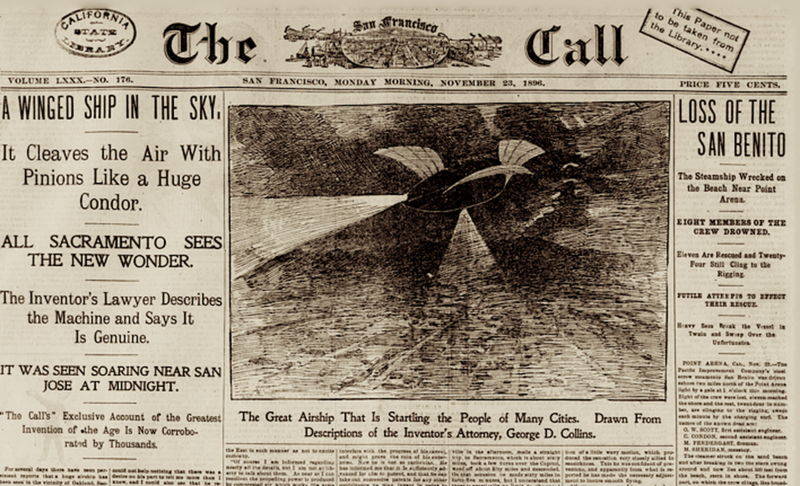 The “Airship” Sightings of 1897 – Alien UFOs? Secret Technology? Or Time Travelers? The wave of airship sightings over the skies of North America of 1897, actually began in November 1896 in San Francisco, California, when an airship was seen by hundreds of people traveling “against the wind” and using “searchlights” as it moved through the air. Several hours later there were further sightings over Santa Rosa and Sacramento that appeared to be of the same craft. It appeared as if it were heading for Mount Shasta, an area that modern-day uflogists insist is a hot spot for UFO activity and some even theorize that a portal exists there. 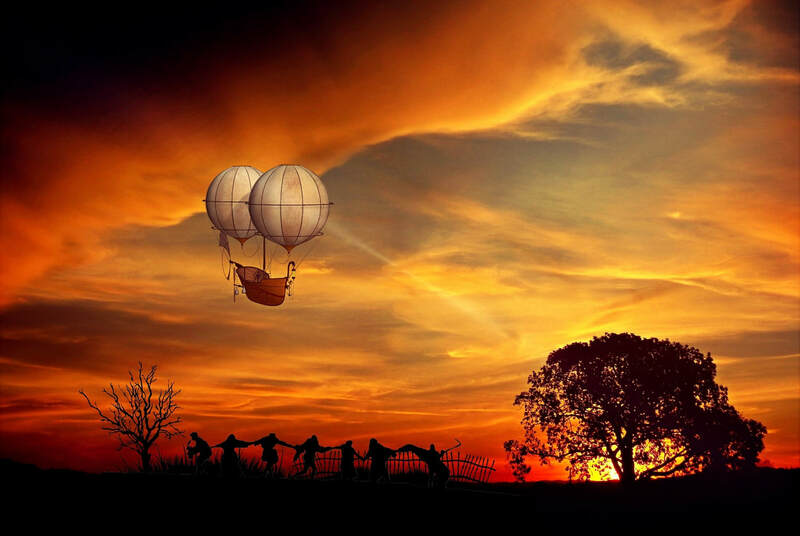 Over the next few months there were numerous sightings of the strange airships and although some were later proven to be hoaxes – several were regarded as very genuine with solid and credible witnesses. A sighting over the skies of Chicago, Illinois on 10th April 1897, for example, was witnessed by thousands of people alone. ​By the time these sightings were reported in Texas, however, they were not just sightings - some were meetings with the crew of the strange crafts. On 21st April 1897, John Barclay was awoken late one evening by the barking of his dogs. He also noticed a “high-pitched whirring” sound outside. Having read about the reports of airship sightings over the previous months, Barclay took his gun and went outside to investigate. To his disbelief once outside, descending nearby, was a strange airship. Barclay also noted that there were bright lights on board the ship “much brighter than electric lights!” As he approached, the lights on the vessel went out. The night, however, left enough light for him to still keep the craft within his vision. He kept on towards it, before seemingly out of nowhere a man stepped into his path and asked him to lower his gun as he would not come to harm. Barclay did as asked and then asked the person his name. When asked if he (Barclay) could see the ship, the man replied “no, we cannot permit you to approach any nearer” and once again asked for him to obtain the items he required and for his kindness they would “call on him some future day” and take him for a ride. The 'Houston Post' reported that Barclay managed to get the oil and chisels but not the bluestone, and because he did not have any change offered the man his $10 back, which he refused and told Barclay to keep. Perhaps the strangest part of this already strange encounter was the reply Barclay received when he asked the man where he was from and where he was going as he made his way back to the airship. In Merkel, Texas, on 25th April 1897, an airship was seen high up in the clouds with what looked like an anchor dragging on the ground below it. The anchor eventually became caught on a railway track. This was witnessed by much of the community who were returning from church at the time. Although the object was seemingly too high up to distinguish with any clarity, it’s shape and bright lights could be seen through the clouds. After around ten minutes, a man, dressed in a blue suit, began to shimmy down the rope before cutting it as soon as he noticed that people were watching him, allowing the ship to sail off through the clouds. After ten minutes or so a figure was seen to exit the ship and make his way down towards the anchor. It was said that the figure “made motions as a swimmer would diving into the water.” As the figure noticed the crowd that had gathered “he panicked” and headed back to the vessel, cutting the rope before the ship sailed away. It was said that the anchor was put on display in the church. You can read the exact wording of the event as recorded at the time here. ​This event almost mirrors the events witnessed in Markel Texas on 25th April 1897. 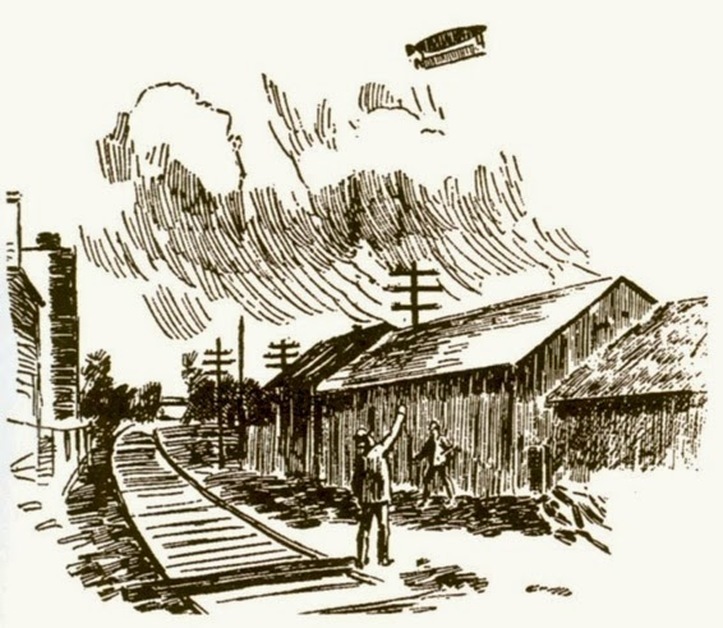 Yet another sighting happened just over a week later on 6th May 1897 at Hot Springs, Arkansas, when Deputy Sheriff McLemore and Constable Sumpter witnessed an airship land nearby on an extremely rainy night. The other man was observed filling “sacks full of water” while the Sheriff noted that the woman kept herself hidden away, with an umbrella pulled down over her face. The policemen were invited to join the strangers on the vessel saying “we can take you where it is not raining!” They politely declined. And with that, the ship was gone. What is also interesting about the sighting in hot springs is that it is a site of natural crystal. Some surmise that where there are natural crystal formations, along with tectonic plate activity, the release of energy can be made to open “time-holes” and “portals.” We touched on this in our look at Bigfoot sightings (which you can read here) and the Bennington Triangle (that you can read here). In the book “The Great Texas Airship Mystery” by Wallace Charlton, it was argued that many of the witness statements and descriptions of the airships resembled modern-day accounts of UFO sightings – in particular the presence of bright and multi-colored lights, the cigar shape of the craft, the speed at which it moved, as well as the quiet yet very noticeable “whirring sounds” that seemed to accompany them. While many have indeed looked at these events as alien UFO sightings, it seems they could have more in line with either secret testing of technology unknown to the public at large, or the almost unthinkable possibility that what people witnessed were time-travelers. Could it be possible that what was witnessed was secret technology being tested? However, it seems unlikely that this technology would have remained secret throughout the next fifty years or so – especially given the turmoil the planet would go through in the upcoming two world wars. 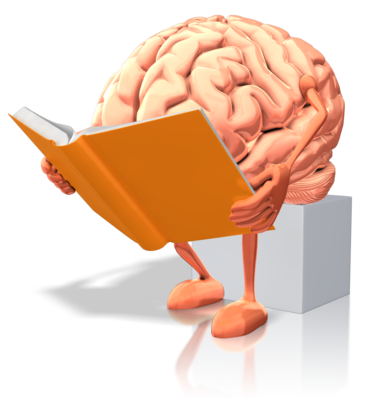 You would have expected it to be utilized by one side or another, had it been available in such a physical and tested form. So if not aliens or secret technology, what about time-travel? Were these airships traveling through time, utilizing portals at certain points around the world? Did the man who spoke to Barclay literally mean he would be in modern day Greece due to the speed of the craft – or might he have meant Ancient Greece? David Hatcher Childress, for example, in his book “The Time Travel Handbook” states that most of the Ancient Astronaut theories and hypothesis could be easily explained as time-travel and time-travelers. Not to say that these sightings offer definitive proof of time-travel, but given these particular events, the credibility of many of the witnesses, and the technology that appeared to be on display that was clearly ahead of its time, it should not be completely ignored. The argument that if time travel did ever become a reality we would surely know about it, as someone would have come back to see us, doesn’t really hold too much weight. Let’s face it if somebody was to make the claim that they have traveled from or to the future (and some have - check out Al Bielek and The Book of the Future) how seriously do you think they would be taken by the public at large? Check out the videos below. The first is a quick overview of the Airship sightings of the late 1890s, while second features Jim Marrs speaking in depth about them. The final video is a public conference on the subject. 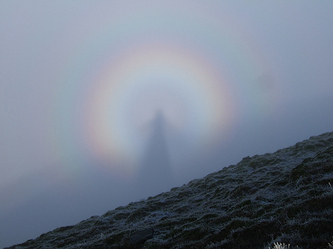 The Big Grey Man Of Ben Macdui – A Scottish “Big-Foot” Or A Supernatural, Paranormal Energy? There are plenty of accounts of "activity" on Scotland's Ben Macdui, so what exactly could be being witnessed? ​ From The Ant People And The Hopi Tribe to Admiral Richard Byrd – How Credible Is The Hollow Earth Theory? ​Al Bielek – The Montauk Project And “Memories” Of The Twenty-Eighth Century? Just who was Al Bielek and had he really seen the future? And what about Project Montauk? ​Spring Heeled Jack – The Devil? A Clever Hoax? Or A Lone Alien In 19th Century England? Spring Heeled Jack was witnessed throughout England throughout much of the 19th century - could he have been an a lone alien on our planet?